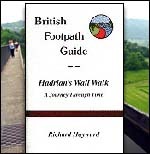 Guide to a walk along the Wall... Explore how and even why, the Romans went to the trouble to built this massive wall. Was there more to the wall than to just keep those northern barbarians on their side of the border? After 2,000 years, the Wall still teases our imagination and haunts our dreams. B&B list, pub notes, maps, etc. Housesteads & Vindolanda (8 miles). VINDOLANDA is the most fully excavated Roman civilian settlement near the Wall. Excavations have revealed unique examples of leather goods, textiles, and personal letters written on thin slabs of wood. There are lifesize replicas of Stone and Turf Wall. Housesteads is the most complete Roman fort on the Wall -- with all four gateways, chariot ruts, barracks, HQ building, granaries & Roman latrine. Return to Once Brewed via Cuddy's Crags. The names, Once Brewed and Twice Brewed, invite a story and a smile, preferably over a shared pint. Here goes: Twice Brewed is the name of the inn and a collection of local farms. Several stories exist about the origin of the name. My favorite involves our old nemesis, Edward I, who supposedly visited the inn for a hot toddy on his way to Berwick in 1206. The king liked the drink so much he asked the landlord to "brew it again." Thereafter the pub became known as the Twice Brewed. A second story "equally apochryphal " says General Wade was traveling from Newcastle to Carlisle to cut off Bonnie Prince Charlie. Wade called at the pub and com-plained the ale wasn�t strong enough, and urged the innkeeper to "brew it again." The general liked the result so much that he stayed too long at the inn. By the time he reached Carlisle, Bonnie Prince Charlie had gone! Wade blamed it on poor road conditions ... and so the 18th-century Military Road came to be built. As for Once Brewed Youth Hostel, an equally amusing (though less apochryphal) account tells of the hostel's 1934 opening under the patronage of Lady Trevelyan. A life-long teetotaller, the lady observed in her opening speech that the hostel was uncomfortably close to Twice Brewed Inn. "We will serve nothing stronger than tea," Lady Trevelyan remarked, "and I hope even that will only be once-brewed!" Bingo! The name stuck.